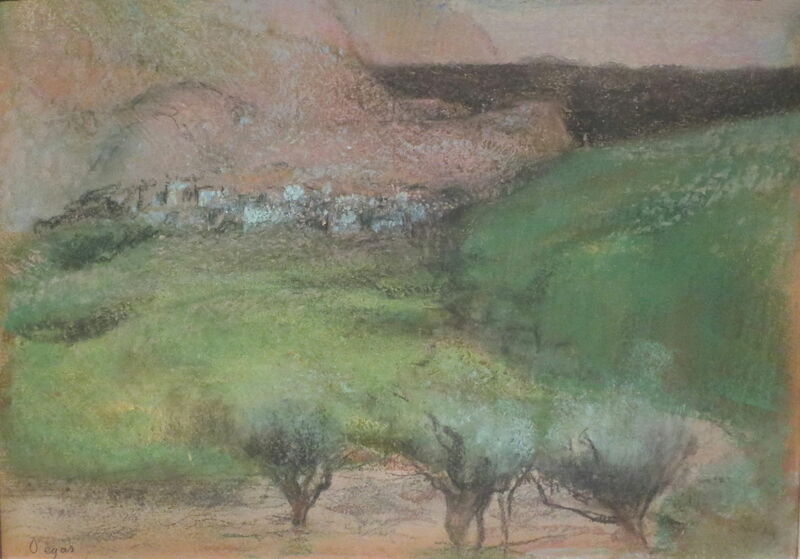 Edgar Degas (1834–1917), Olive Trees against a Mountainous Background (c 1890-92), pastel over monotype on paper, dimensions not known, Norton Simon Museum, Pasadena, CA. Wikimedia Commons. If Degas is not known today as a history painter, few would believe that he had ever painted landscapes – but he did, and quite a few too. This article may help persuade you that, although the great majority of Degas’ paintings were indoors, he remained an intermittent landscape artist almost until he was unable to paint any more. Overall, it is estimated that about 7% of Degas’ total output consists of primarily landscape paintings. 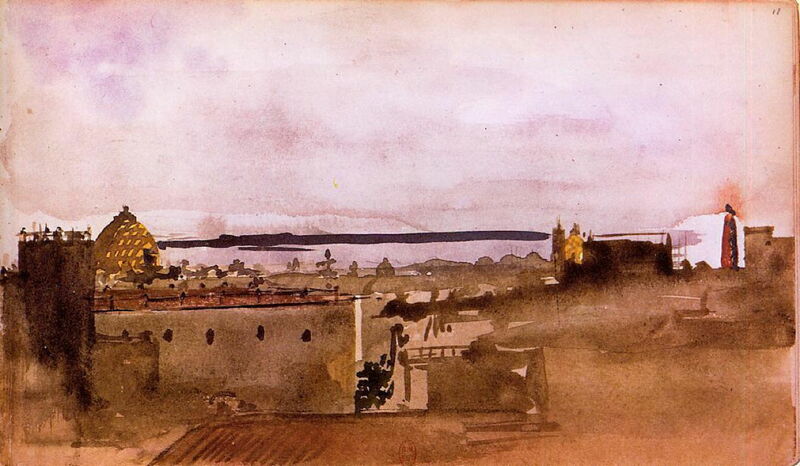 Edgar Degas (1834–1917), View of Naples (1860), watercolour, dimensions not known, Bibliothèque Nationale de France, Paris. The Athenaeum. When Degas was in Italy, between 1856-59, he made a number of landscape sketches, some in oil on paper, others like this View of Naples (1860) in watercolour. None seems to have been developed into anything more substantial, though, and he then switched to history painting and portraiture for the next decade or so. 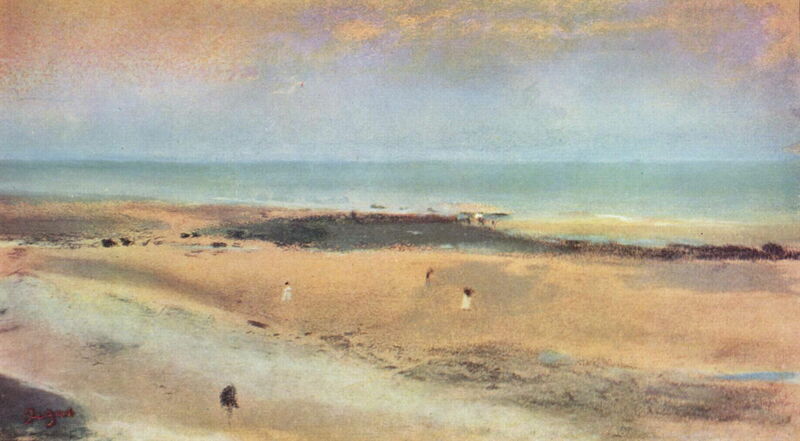 In the summer of 1869, Degas travelled to the Normandy coast, where Édouard Manet was painting, and stayed as a guest of Berthe Morisot’s family, near Cabourg. 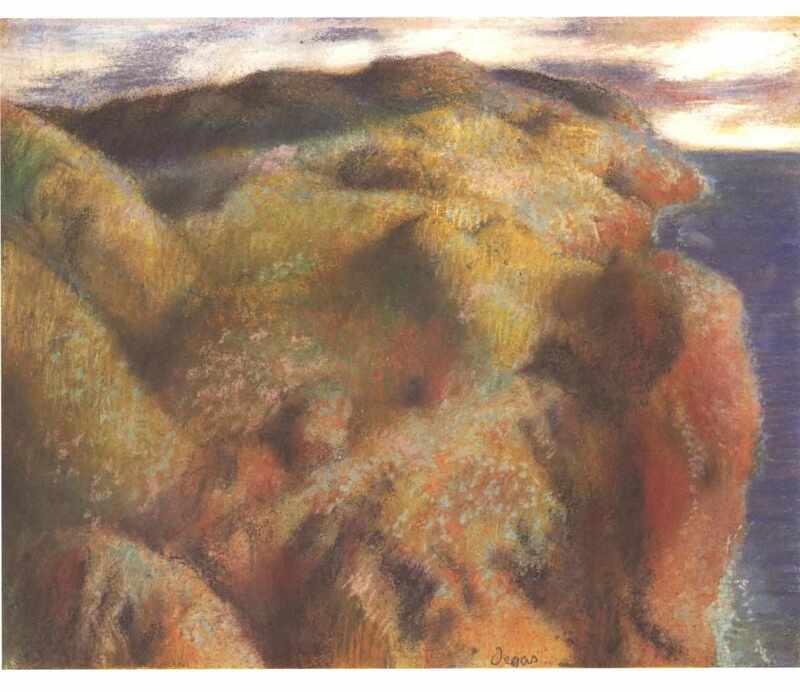 As a result of this visit, he made a series of more than forty quite small pastel paintings showing the flat and largely empty beaches there. These contrast markedly with his previous and subsequent art, in which drawing and form are of great importance. Eugenia Parry Janis considers that at this time he “was a draughtsman learning to paint”. 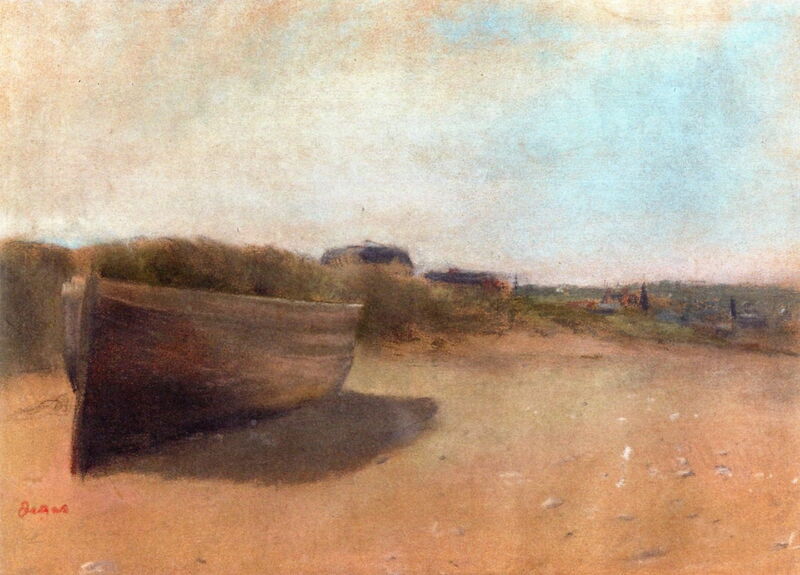 Edgar Degas (1834–1917), Beached Boats (c 1869), pastel on paper, 22.2 x 31.1 cm, Private collection. The Athenaeum. 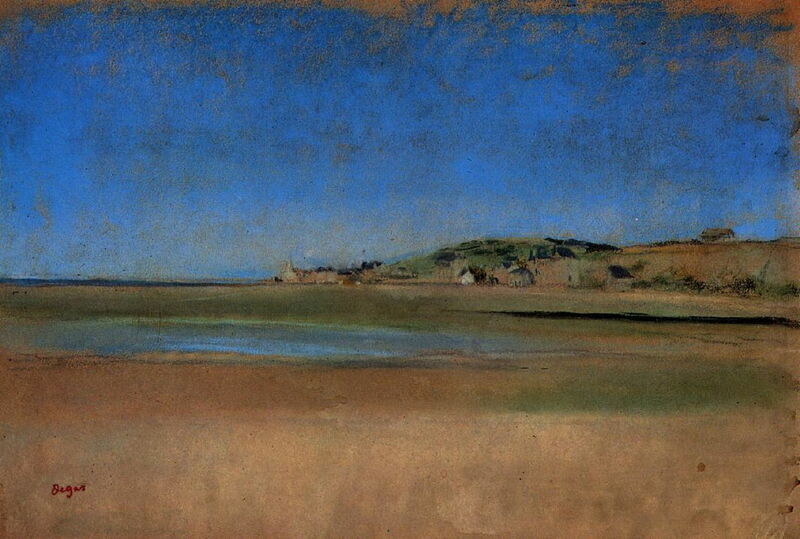 Edgar Degas (1834–1917), Houses by the Sea (c 1869), pastel, 31.4 x 46.5 cm, Musée du Louvre, Paris. The Athenaeum. 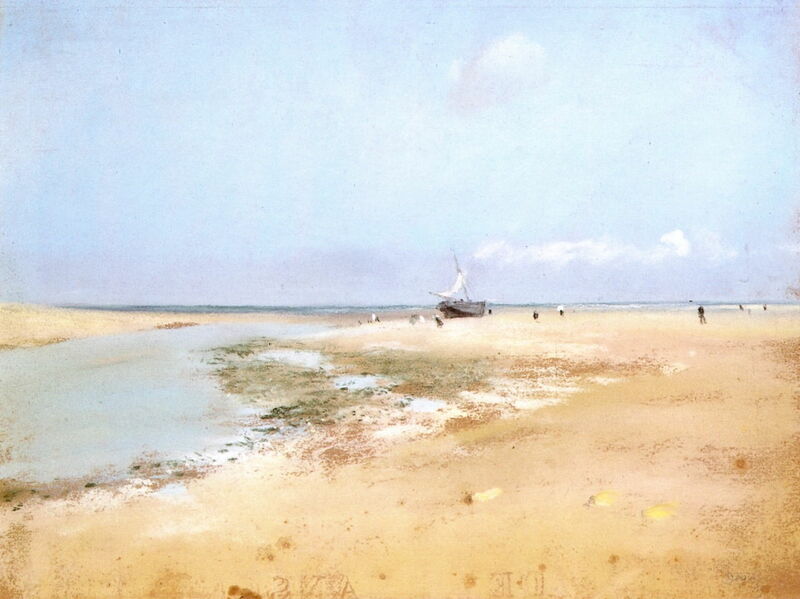 Edgar Degas (1834–1917), Beach at Low Tide (or Mouth of the River) (1869), pastel on light brown paper, 23 x 30.5 cm, Private collection. The Athenaeum. 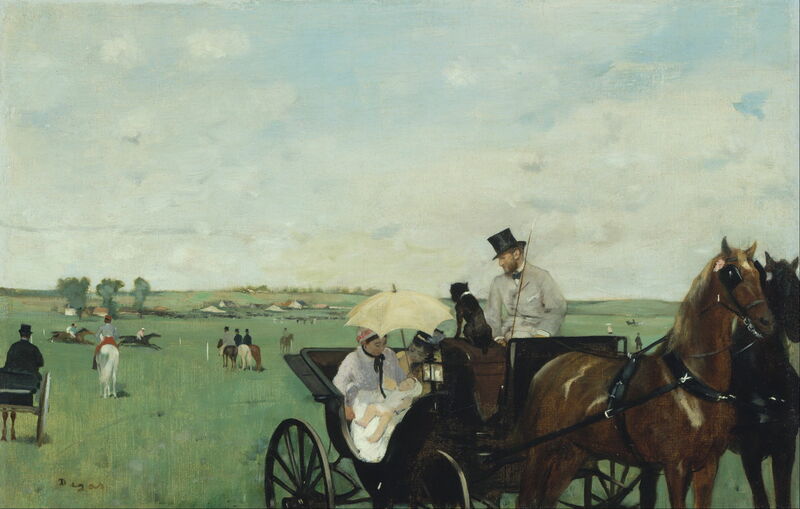 In 1861, Degas’ interest in horseracing was kindled when he visited a former schoolfriend on his country estate. From about 1869 onwards, his paintings of horseracing often contained substantial landscape passages, and some were perhaps more landscape than horseracing. Here is a small selection of them spanning the years in which he painted these equestrian works. 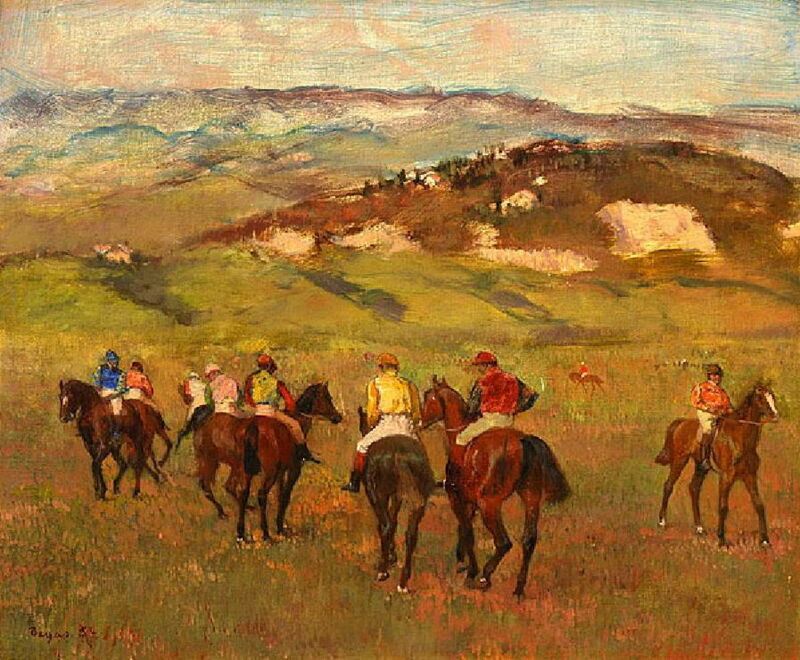 Edgar Degas (1834–1917), At the Races in the Countryside (1869), oil on canvas, 36.5 x 55.9 cm, Museum of Fine Arts, Boston, MA. Wikimedia Commons. Edgar Degas (1834–1917), Horses in a Meadow (1871), oil on canvas, 31.8 × 40 cm, National Gallery of Art, Washington, DC. Wikimedia Commons. 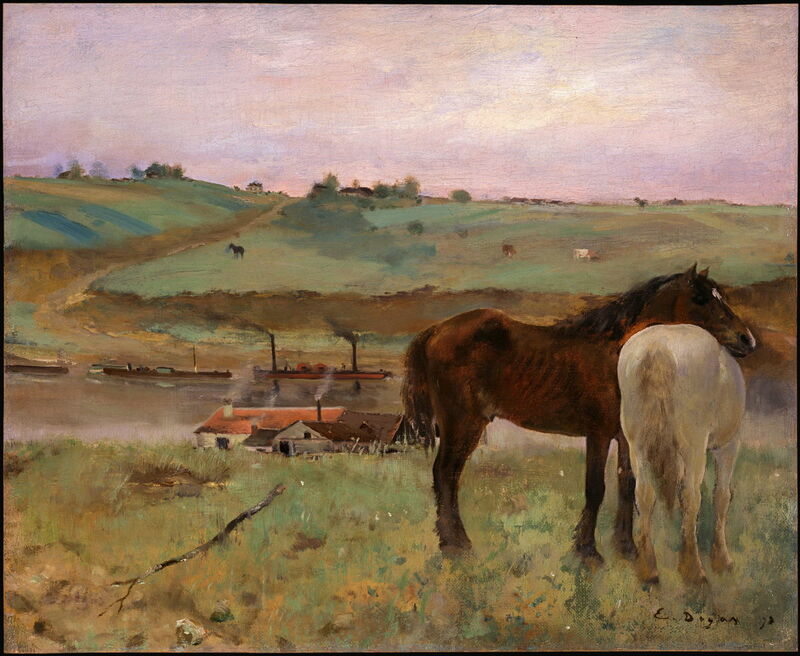 Horses in a Meadow (1871) is particularly interesting because it includes industrial elements, in the form of smoking chimneys and the steam vessels in the river behind. These are often cited as being characteristic of impressionist paintings, but are equally typical of Degas’ pursuit of images showing ‘modern life’. Edgar Degas (1834–1917), Jockeys on Horseback before Distant Hills (1884), oil on canvas, 44.9 × 54.9 cm, Detroit Institute of Arts, Detroit, MI. Wikimedia Commons. Edgar Degas (1834–1917), Race Horses (c 1885–88), pastel on wood, 30.2 x 40.6 cm, Metropolitan Museum of Art, New York, NY. Wikimedia Commons. 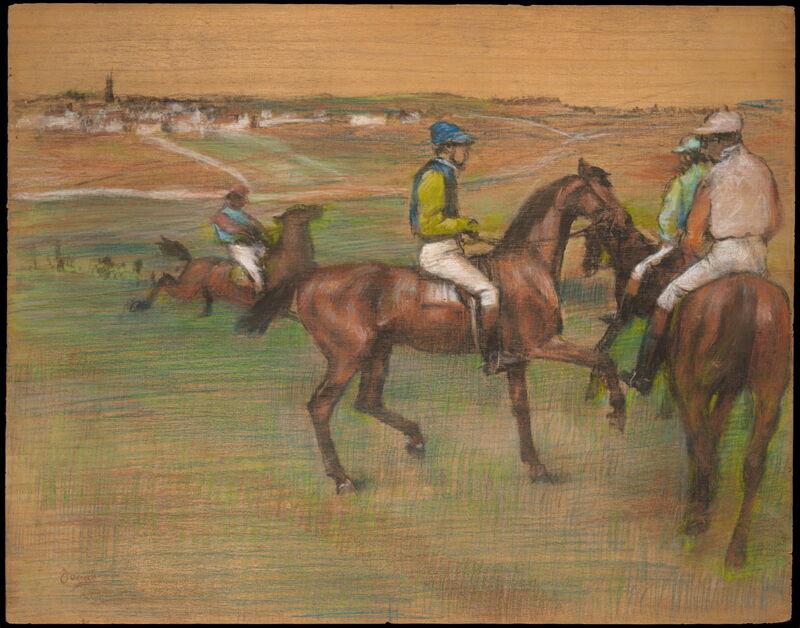 Race Horses (c 1885–88) is an unusual pastel painting which Degas made directly onto wood, whose grain remains visible. Edgar Degas (1834–1917), In the Woods (c 1870-73), pastel on paper, 35.2 x 26.4 cm, Private collection. The Athenaeum. 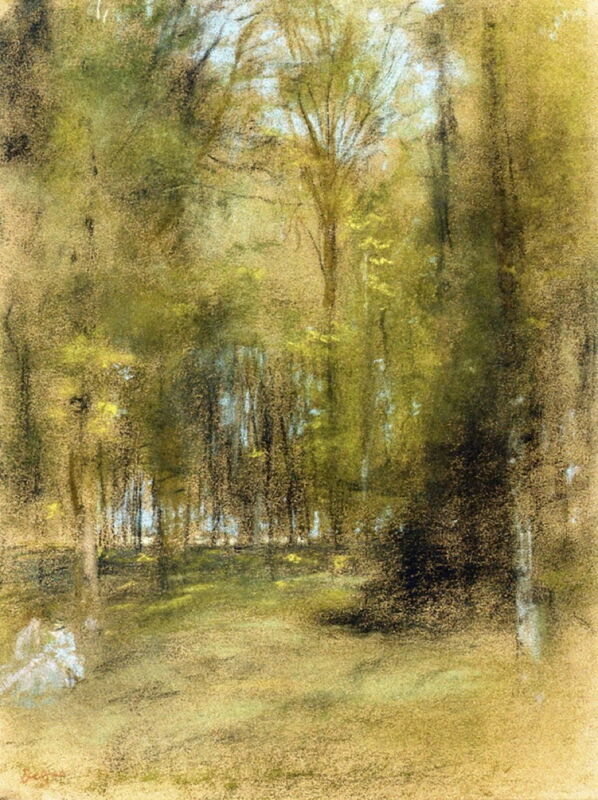 In addition to the landscapes listed in other sections here, Degas painted occasional outdoor views, such as In the Woods (c 1870-73), made using pastels. In 1890, two decades after his short landscape campaign on the Normandy coast, Degas suddenly started to paint landscapes again. Although these were finished using pastels, many were painted onto monotype prints which he made during a visit to a friend with a studio near Dijon in the autumn of 1890. These seem to be idealised or fanciful views rooted in real landscapes which he had seen during his travels. A first group of about thirty are thought to represent scenery around Dijon which he saw in 1890, and a second group of about twenty-one were made in response to views which he saw from a railway train when he travelled through the Pyrenees and elsewhere two years later. In November 1892, twenty-one of them (mainly from the second group) were brought together for Degas’ first one-man exhibition, held at Durand-Ruel’s gallery in Paris. This turned out to be the artist’s only solo exhibition held during his lifetime. 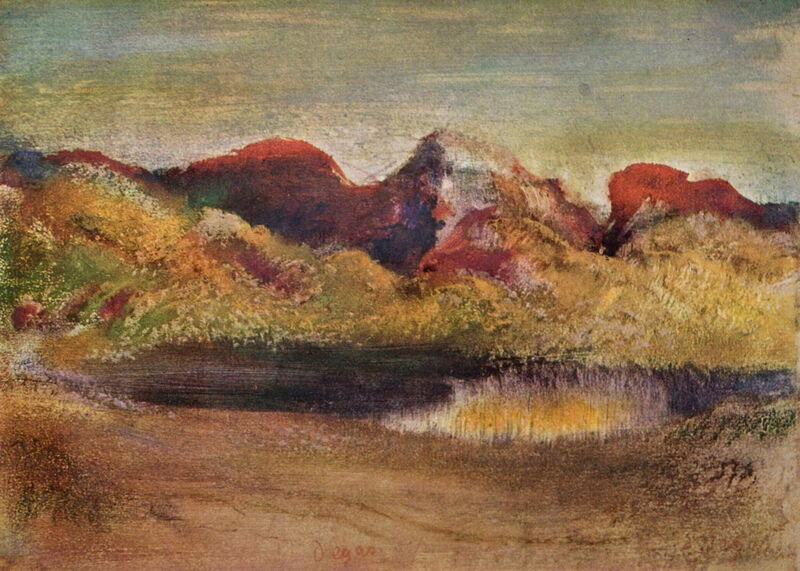 Edgar Degas (1834–1917), Lake and Mountains (c 1890-92), pastel, 25 × 34 cm, Private collection. Wikimedia Commons. 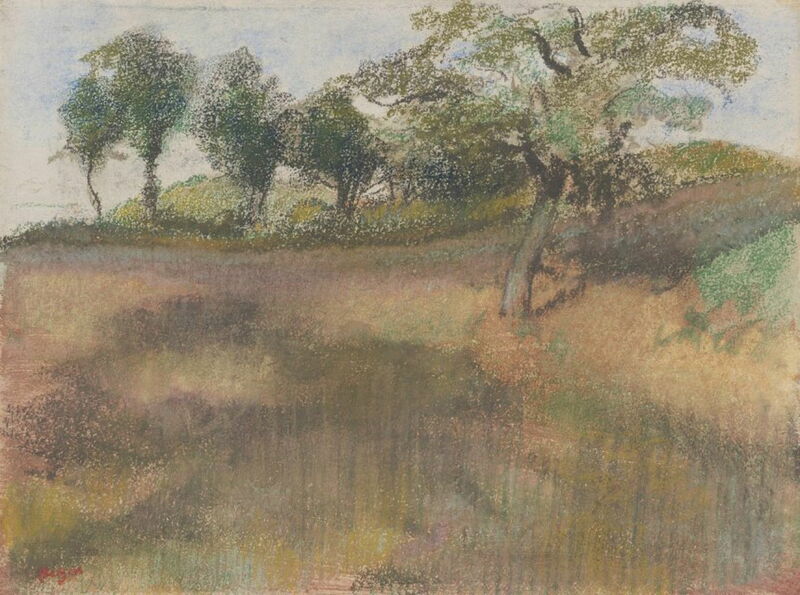 Edgar Degas (1834–1917), Landscape (1890-94), pastel on paperboard, 51.1 x 50.5 cm, Museum of Fine Arts, Houston, TX. Wikimedia Commons. 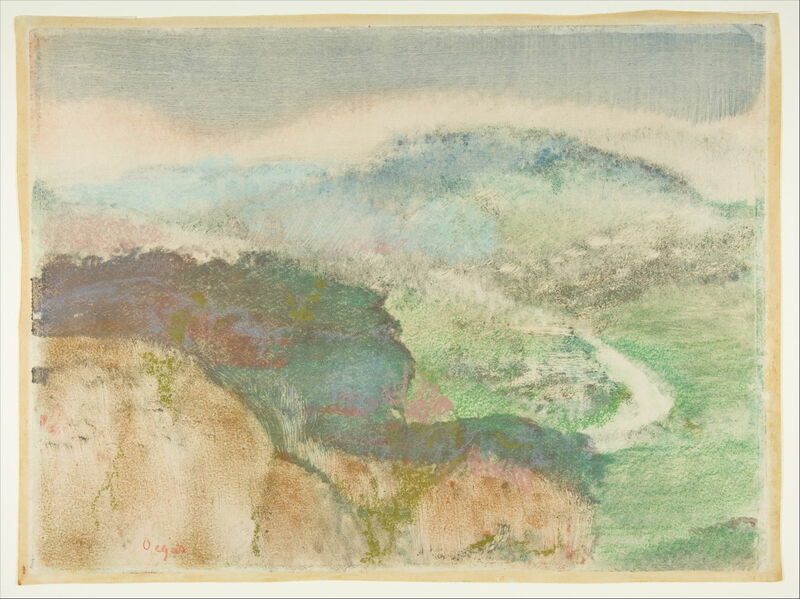 Edgar Degas (1834–1917), Landscape (1892), monotype in oil colours, heightened with pastel, 25.4 x 34 cm, Metropolitan Museum of Art, New York, NY. Wikimedia Commons. Edgar Degas (1834–1917), Ploughed Field Bordered by Trees (c 1892), media and dimensions not known, Art Institute of Chicago, Chicago, IL. Wikimedia Commons. 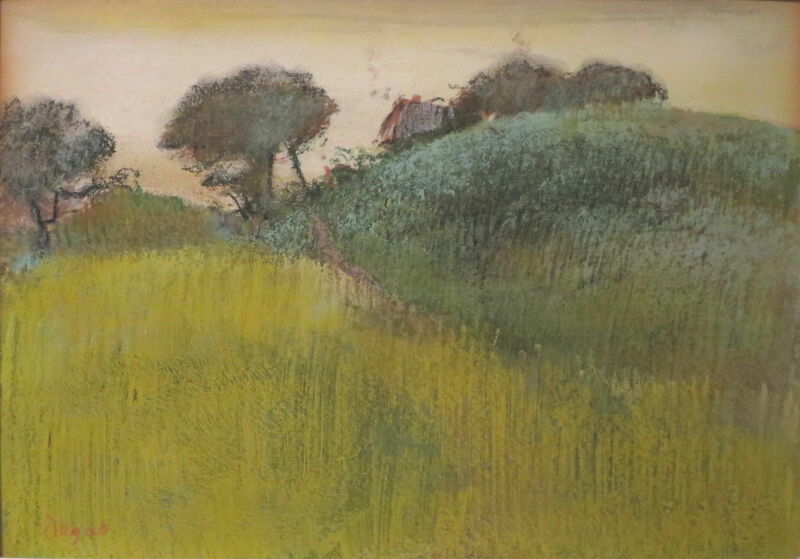 Edgar Degas (1834–1917), Wheat Field and Green Hill (c 1890-92), pastel over monotype in oil colors on paper, dimensions not known, Norton Simon Museum, Pasadena, CA. Wikimedia Commons. 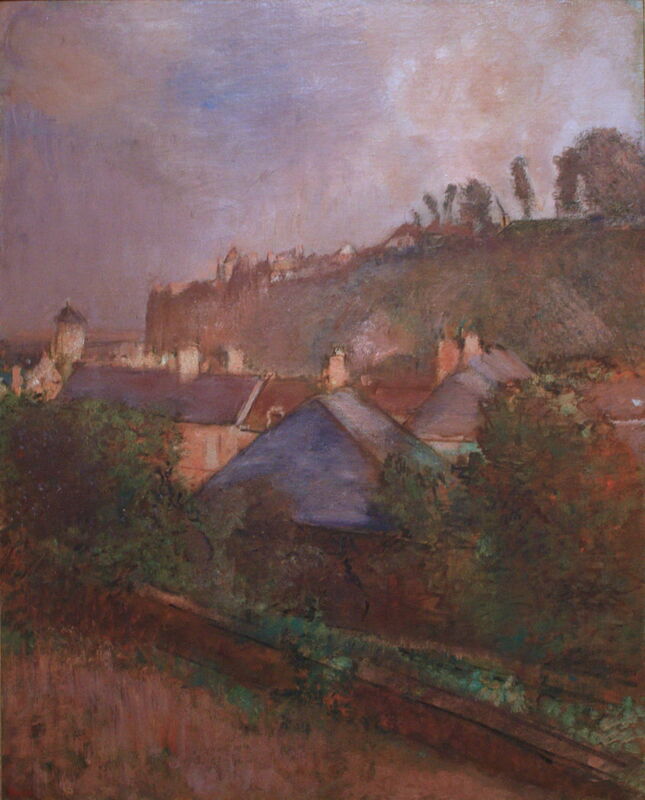 Degas’ final landscapes followed about three years after that exhibition, as his eyesight and health were deteriorating, and he became increasingly withdrawn into his own company. As with his earlier paintings of horseracing, these fifteen or so views were made mainly using oil paints, with a few in pastels, and centred on the village of Saint-Valéry-sur-Somme in Picardy. The artist had visited this village during family holidays in his childhood and youth. During the mid-1890s, he returned, staying either with his brother René or the painter Louis Braquaval, and seems to have painted these views of the village by the end of 1898. He is also thought to have taken many photographs of the village at the time, although those have subsequently been lost. Edgar Degas (1834–1917), Houses at the Foot of a Cliff (Saint-Valéry-sur-Somme) (c 1895-98), oil on canvas, 92 x 73.2 cm, Columbus Museum of Art, Columbus, OH. Wikimedia Commons. 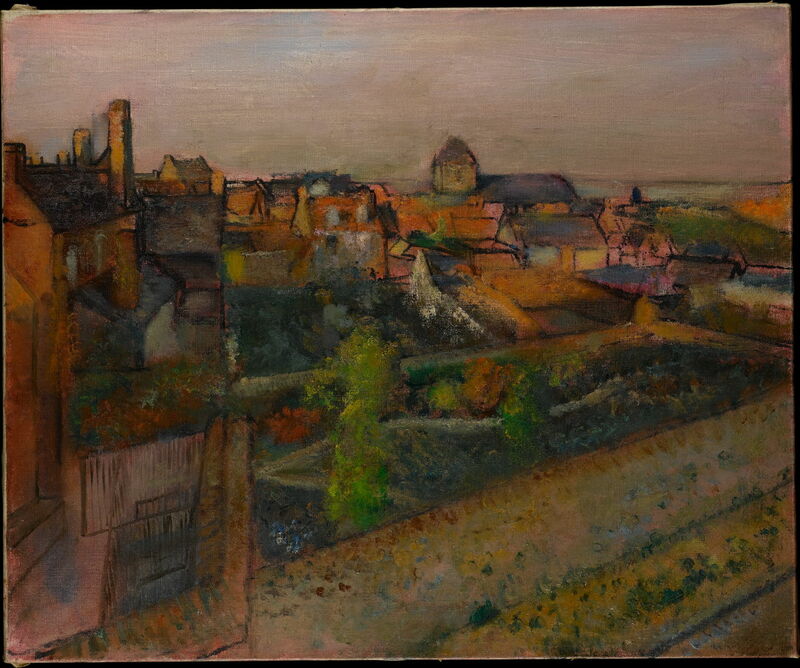 Edgar Degas (1834–1917), View of Saint-Valéry-sur-Somme (1896–98), oil on canvas, 50.8 x 61 cm, Metropolitan Museum of Art, New York, NY. Wikimedia Commons. Comparisons have been made with the work of Gauguin, and the late paintings of Cézanne. 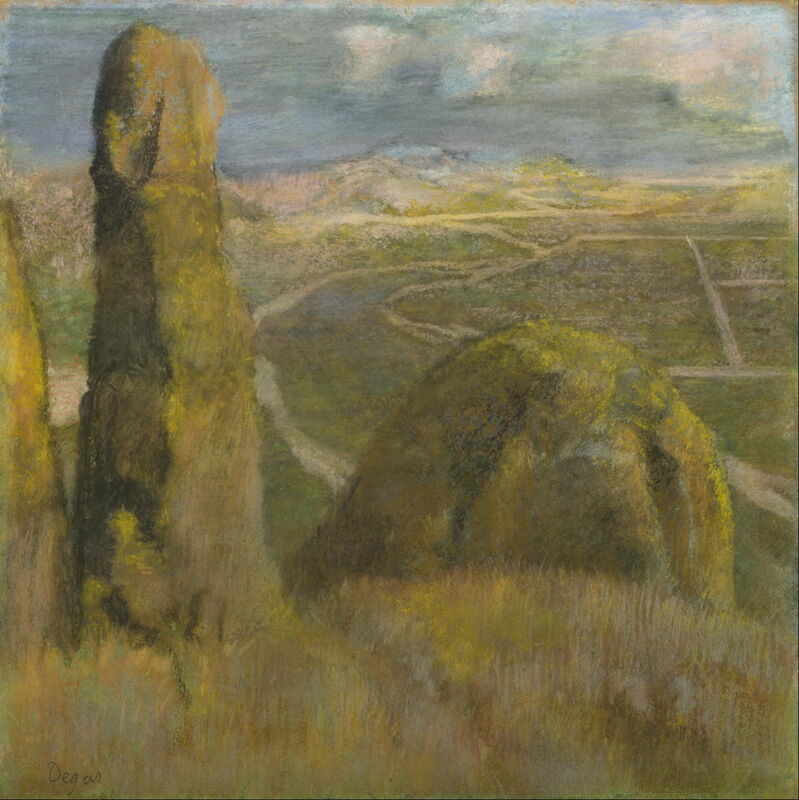 For Degas, these landscapes may have been sentimental visits to his childhood. Like his other landscape paintings, they make Degas an even more enigmatic artist. Posted in General, Painting and tagged Cézanne, Degas, Gauguin, Impressionism, landscape. Bookmark the permalink.